The Galaxy S9+ recently underwent a bill of materials analysis by electronics research firm TechInsight. It turned out that the S9+ is more expensive to build than both the S8+ and the Note 8, but not quite as pricey as the iPhone X. We weren't surprised that the S8 models were cheaper to produce than the new Galaxies, but what makes the new S9+ more expensive than the Note 8, which also had a dual-cam setup, but also sports a slightly bigger screen and S-Pen support? 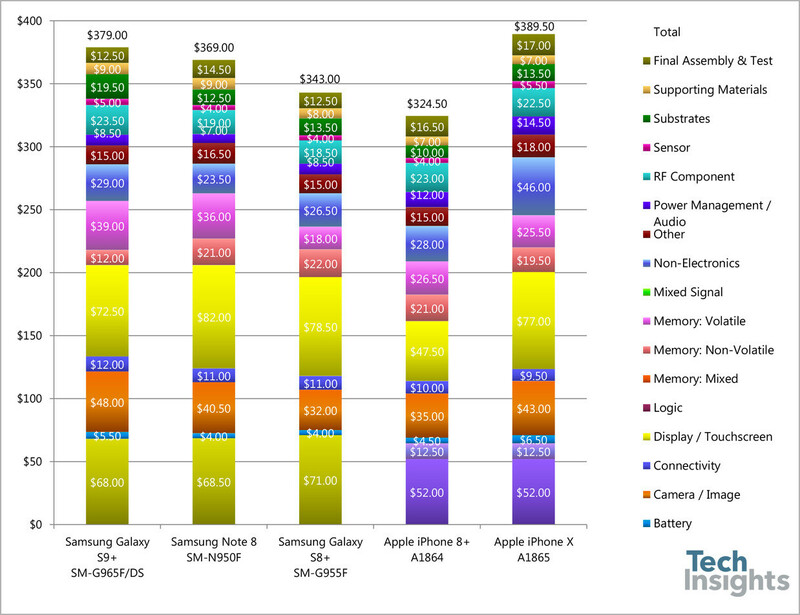 Well, it's hard to pinpoint exactly, as component prices vary slightly, but it's interesting to note that the camera of the Galaxy S9+ is the third most expensive component in the phone, after the display and chipset, and is also slightly more expensive than that of the iPhone X. In fact, at $48, the S9+ camera is the priciest smartphone camera we've seen in a while. The dual-cam array of the iPhone X costs $43 to produce, while that of the Note 8 comes at $40.50. Seeing as how the S9+ actually uses the same Dual Pixel ISOCELL sensor in its main camera as the Galaxy Note 8, the increased cost can probably be chalked up to the new variable aperture mechanism that was implemented in the S9+. If only they provide a software update to stop the overexposure of most shots and make full use of all that hardware... What's the use of the best camera hardware in the world when your software can't even take full advantage of it, and gets beaten by pixel 2, which has worse hardware than the S8 even. Pixel camera has some lens flare issue. That was the pixel 1. Haven't heard about anything on the 2.